Leviathan is the accomplishment of the totality, the sublimation into the monadic drive. The sum of its oppositions spread outwards into the stratosphere, escaping from and then re-conquering the jungle from which it came. The war of all against all is driven upwards, to the bounds of national sovereignty and the slow elimination of the borderlands. The subject is made the state, as the state itself becomes all-encompassing, mythologising it’s everlasting quality as a foundational axiom. It developed because it needed to be developed, tautologically justifying itself as a result of the condition of brute human nature. However, with its tentacles spreading ever further, it reaches the point of contradiction. In subsuming the antagonisms of society at large, it either accepts these as an existing framework for debate and conflict (thereby creating in itself the means to be wrought open), or makes itself increasingly totalitarian in its imaginations. All conceptualities come under its gaze in the latter formation, leading to a “commonwealth itself” becoming “a ‘demonic machine’, a tremendous enthusiasm mobilised against every other”. The rationalist philosophy of Hobbes must take on the character of ideological totality, and thus in internalising conflictual patterns into its mythology must either let them fester (thus picking away at the initial wound) or externalise them as the enemy outside of its purview, to be removed. Hobbes’ doctrine/prescription can be seen as a reaction to the English Civil War, a period where the striations of sovereignty within England were split not just between parliamentarians and royalists but among a vast variety of Christian sects, militias and local strata of power within and amongst incorporated cities, earldoms, etc. Sovereignty was effectively abnegated as a national concern, with destructive conflict spilling over across the breadth of England. In this context, the evolution and subsequent revolution of heterodox religious movements and sub-political units demanding particularistic political dynamics led to the “nightmarish” situation of “the proliferation of swarming sects with infinite ‘names and peculiar doctrines’”, undermining the totality of the state and putting its antagonisms on full view. The attempt to construct a mechanistic bureaucratic praxis combined with an all-encompassing juridical understanding of law and the state is at least understandable considering the bloody horror that antagonistic factionalism can breed. This petty totalitarianism is a greater alternative compared to the jungle that lay just beyond the bounds of national sovereignty according to Hobbes. But as noted the pettiness of this totalitarian creature cannot be constrained, as by its nature it must consume that that is internally conflictual with its mythology. Hobbes’ understanding of religion clearly shows this contradiction, as the heterodoxies and multiple meanings of scripture are subordinated to the orthodox versions of the state. He pulls forth scripture that intones a Christian apathy to governance, accepting what stands before it as the natural order. All processes of meaning-making that are in distinction or contradiction to the sovereign myth are antecedents to their pre-sovereign jungle, the proto-anarchy of generalisable conflict and war. And as a result that cannot be tolerated, leading the original petty character that defined certain liberal limits to the state (preventing the sovereign from needlessly interfering in the trade of individuals for example) to slowly morph into increasingly stronger regulatory avenues, increasing its scope, size and pressure such that most facets of life interact with this blob called Leviathan. By internalising and attempting to eliminate and control these base conflictual dynamics, the “war machine”, that pre-sovereign element of non-central control that is both internecine and innovative, it attempts to construct a polity fiercely opposed to ambiguity, autonomy or the ability for multi-scalar variability. All these patterns suggest control not as the tentacles of the Leviathan state, but as multiple structures in a complex collage of conflict and socio-political evolution. In this war machine (the jungle behind and beyond Leviathan) Hobbes sees the state as the socio-technic mechanism to escape the jungle and effectively control the flows of conflict. The state as centralised controller has the ability to direct these flows down certain routes (i.e. imperial expansion and/or internal homogeneity). These flows, as war, are the intersection of contingency and agreement-fragmentation-resolution dynamics. War in the Hobbesian sense is more than just the simple act of battle, but instead the abnegation of fully formed state sovereignty. His theoretical basis in the English Civil War, where sovereignty moved from a monarchic state to effective breakup through heterarchical sovereignty across multiple plains, saw the existence of groups vying for sovereign control, and the consistency of debates (Putney Debates and Agreement of the People), riots and sub-groups looking for control within wider movements (guilds, incorporated cities and other forces). Leviathan in this case was split, re-engineered and made cellular through conflict and the vie for power of multiple kinds. War was more than simple destruction, but the complete reconstitution of sovereignty into the jungle of conflict and autonomous powerbases. Hobbes sees this as the primary thing to guard against, to prevent man falling back into a natural position of base conflict. In doing this, the state must constantly expand, increasing the complexity of its distribution and conflict-management so as to prevent the internal dynamics of autonomous powerbases and shadow governments destroying the mythological power the state holds. This leads to a situation of ever-increasing complexity and the subsequent reduction in productivity gains that come from this complexity when certain limits are reached. As Tainter noted in regards to a large number of classical civilisations, their expansionary gains, that were meant to quell the conflictual bases of support that the state(s) were founded upon by increasing revenues and overall wealth through expropriation and greater trade, slowly decreased in output and then gradually became maladaptive. This happened to the Roman Empire, where the increasing cost of further expansion came to be more expensive than the purported gains. Expanding into areas like Mesopotamia and Assyria had higher costs than anticipated, and the subsequent increases in the tax base and the number of people to expropriate from did not match the initial cost of military expansion. The same diminishing productivity gains can be seen in the city-states of the Chacoan system, where a distributed collection of agricultural surpluses allowed for increasing expansion, incorporating more villages and great-houses who could increase the surplus and allow for its general distribution across the system, thus preventing any individual component from becoming impoverished or unstable. However, this expansion eventually began to include unproductive areas, where food surplus provision was minimal and didn’t contribute to the overall system, eventually leading to misdistribution that produces political grievances and the desire to maintain one’s own surplus rather than see it wasted on unproductive activities. Tainter in this analysis sees the state as a combinatory form of cooperative behaviour to allow for better information processing and resource distribution, as well as the ability for vested interests to develop an increasingly homogeneous powerbase where hierarchical control is paramount thus controlling labour and the flow of capital. Not dissimilar then to the Hobbesian understanding. However as the increases in productivity begin to diminish with increasing size and complexity, eventually becoming negative as resource surpluses are used up and finances are drained, the mythology of this state-power is actually ramped up. During the last days of the Mayan and Chacoan civilisations, the building of monuments to leaders and gods increased significantly, as well as an increase in the number of temples and great-houses (in Chaco). This further confirms Garton’s view that the Hobbesian picture of expansionary statehood must always tackle the internal antagonisms and alternate powerbases which plague it from beginning to end. Even at the height of death, this mythology is impressed in even greater vicissitude. But behind the mythology the underlying reality is that with diminishing returns on complexity, the rational development is to increase autonomy (as was done when units within the system withdrew), to increase one’s independence relative to the centralised unit and thus accumulate a form of socio-economic power. Sovereignty in this sense is not the totalisation of central units, but the complex dynamics of carving parts out of the jungle, fully recognised in their fragile temporality and constantly reforging their internal structures and external borders. One need only look at the history of governance to see this spiralic continuum. While Hobbes sees the state as the mechanism for escaping the jungle and impressing order upon the war machine, the internal relations of states that lead to diminishing returns on complexity create a situation that necessitates fragility and flexibility, with the state only one among many organisations for the development and inculcation of variable levels of societal complexity. The jungle surrounding the state is space, ineluctable and always present, there to fall back into as all forms of governance melt into nothing. It can be seen in the extreme destruction wrought by the English Civil War, and in the processes of breakaway states and autonomous regions pulling power and resources back within their grasp. State governance is an element of the wider space mentioned. As Mann identifies, state power is territorial and infrastructural. It holds a loose monopoly of force over a given territory and emplaces rules to maintain said monopoly. But alongside this rules-based infrastructural power exist other elements of socio-political organisation and capacity: force, exchange and custom. Now these are liquid categories that blend with each other and have never existed as static machinations in their own right. What they show is a matrix of socio-spatial power being the wider generative framework of statehood, whereby statehood is never a fully formed concept, but a patterned set of relations that exist alongside the other organisational mechanisms such as local customs, private law systems and exchange networks that states participate in and set some rules over. This however is itself under extreme contention as other forms of organisational power exist alongside and in-between the lines of territorial governance, ranging from local and regional political forms to international forces which have their own bases of power independent of but intertwined with states, as noted in the processes of collapse of complex states’ governance into decentralised polities and subdivided bases. As well as the existence of different organisational loci (rules, customs, exchange and force) there are institutional mechanisms that show a plurality of governance forms, including commissions (rules-based and knowledge found through experts i.e. engineers, lawyers, etc. ), connections (informal information processors, usually delineated through planning organisations or business networks), consociations (social citizenry as a concept of this movement; tends to be developed by regional politicians such as mayors who form working groups and think tanks to push social policies), and coalitions (social movements and groups organised around key ideological drivers; interest groups pushing particular policies). These organisational and institutional loci present a social ecology where states may well be dominant in some functions, but play the role of partner or subordinate in others. There is no totality here, only differential processes of social learning and policymaking that are developed by and affect multiple groups in multi-scalar ways. Overall, the state’s multiplicitous set of functions and powers overlap and cross-pollinate with other organisational loci, always delineated and limited by this growing and variable ecology of background spatio-organisational power i.e. the Hobbesian jungle. A state interacts with other loci of socio-political organisation, from kin-based structures to corporate forms and the flows of capital and war, being both shaped by and shaping those forces in a coagulating mixture of adaptivity to complexity. In this picture the state is much more temperamental, and subsequently a product of contextual social forces at the time of its founding. The concept of a state becomes something multiplicitous, being an ambiguous “arena, the condensation, the crystallization, the summation of social relations within its territories” and thus not something that has the ability to centralise the mass of social contradictions and conflicts under one pure ideological framework. The Hobbesian state and its attempted manifestations through the Westphalian model represent simply another myth of statehood, and this myth attempts ideological hegemony through the destruction of heterodoxy and flattening of multiple loci of power unto one auspice. The history of the state however, as the attempt to work with increasing complexity and allow for greater information processing and goods production and distribution, is one of complexity and the growing needs/wants of populations and alternative political structures outstripping the means of states to deal with rising complexity, eventually giving way to decentralisation and collapse as the socio-technic means of states fall back into the greater technicity of evolutionary processes that include a wide diversity of means as Mann described them. Economic power groupings “exist in decentred, competitive or conflictual relations with one another”; communication networks independent of the state spread ideological variance and a multitude of value structures; military organisation that is quasi-autonomous in its relation to the state – “militaristic control of everyday behaviour requires such a high level of organized coercion, logistical back-up and surplus extraction that it is practical only within close communications to the armed forces in areas of high surplus availability. It does not spread evenly over entire state territories. It remains concentrated in pockets and along communications routes. It is relatively ineffective at penetrating peasant agriculture, for example”. 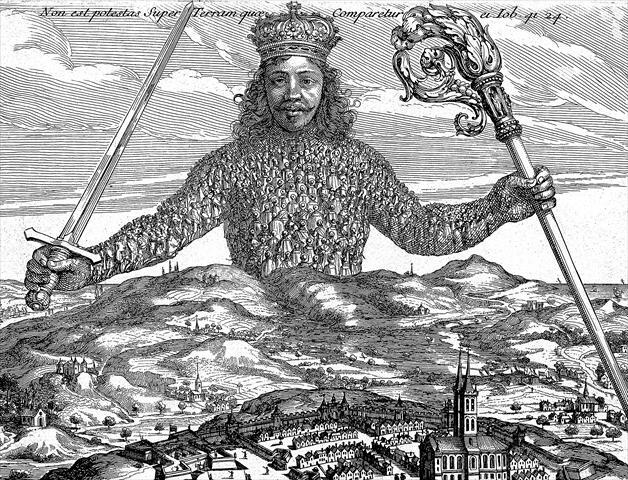 Sovereignty and Leviathan, in holding degrees of infrastructural and coercive military power, are extant variables amongst many in the organisation of goods, values, ideas and peoples. Even in its control of military means (the supposed domain of the state), we see a patchwork of variables interacting, as military power is used where it is most effective, spread across pockets of strength and expanses of weakness. The war of all against all effects the state as much as it does the individual in the imagined anarchy of the original position. Conflict, rising complexity and the means to adapt exist across all these forms as the axiomatic structure of their necessity, with none gaining full totality in the means to organise and adapt. “The organizational autonomy of the state is only partial”, with significant limits to Leviathan existing in the turbulence of organisational capacity. This turbulence produces “uncertainty and change” in governance, moving toward polycentric regimes “involving complex networks of public and private actors engaged in collaborative policy making through open processes of dialogue, social learning and negotiation”. States in this configuration are among a wide range of actors that collate and share information and negotiate in the development of social spheres. While the Hobbesian mould of the state is the totalisation of state power that attempts to guard against sovereignty’s dissemination and fracture into differential elements, the effects of information flow and logistical developments sideline states as one organisational locus among many. “In security affairs the old East-West game payoff matrix has been replaced by a multidimensional array of new players many of them sub-national, some of them unknown. The big wild card is technology. Disruptive technological change and new modes of warfare associated with them have upset the old calculus. North Korea, Iran are not outlier threats but leading indicators of the changed dynamic. They are the first samples of a new threat coming onstream”. This new threat doesn’t just encompass rogue states or axes of evil, but technologies born of war such as WMDs and autonomous weapons which both guarantee and proliferate sovereignty, creating new borders and liquefying others as actors from stigmergic guerrilla forces to computer and AI-based formations come to interact with established state-based military forms. In the territorial sub-space of organisation, where states hold significant power, we see the proliferation of regional forms of autonomy and attempts to pull power into localised units. Regions are vying for infrastructural power, working with and against states and transnational political organisation to develop forms of autonomy in relation to the market, as well as cultural autonomy through the production of social/intellectual capital both in relation to and independent of markets. They work through various mechanisms of organisational power, being part of corporate networks and intergovernmental systems, as well as being influenced by international market forces as cities and regions rely on financial markets for fiscal autonomy from states and work alongside business networks in the formation of policy, thus operating within the turbulent formations of complexity and adapting toward it. This regionalism can be acutely seen throughout modern Europe, particularly in light of the Eurozone crisis and its effects on southern European states. New social movements and political parties have evolved emphasising a regionalism that encompasses cultural, social and economic facets. Greek social forces have pushed for local/regional autonomy through local currencies and the control of economic infrastructure such as nationalised ports, factories and utility companies. Regional parties in Catalonia and wider Spain have pushed for the formation of local utilities such as regional broadband provision, and the development of P2P supply chains and alternatives to the modern sharing economy, such as taxi co-ops and hackerspaces. In a more general sense these methods of autonomy and distribution of power amongst multiple actors are witnessed in the construction of innovative governance through SEZs, charter cities, seasteads and free trade zones. Returning to the original point, the Hobbesian view of the state as a mechanism for totalising social forces of conflict and cooperation under one central auspice is an historically contingent and largely mythical perspective. A totalising sovereign, if it has existed, has always been limited in its capacity for action by the subterraneous groups beneath and within its institutional matrices. The tentacles of leviathan have a regular habit of strangling the king sat atop more than they act as the expansionary organs of a rational state. As an analogous comparison to this Hobbesian concept, one can look at the European Union as the attempt to construct a form of sovereignty that totalises the European peoples under a central arbiter. The increasing centralisation that each new treaty has brought, encapsulated by the idea of ever-closer union, supposes a form of sovereignty that captures the full machinations of statehood at a European level. With the developments of the Eurozone crisis and the imposition of austerity measures which ignore the socio-cultural facets of southern European economies, we begin to see at the very least a strong form of fiscal centrality that desires significant control over national budgets and financial markets. However beneath this surface the EU’s actual working practice that necessitates the integration of major European cities, regions and of course states under an increasingly variable set of legal mechanisms allow for large degrees of autonomy and difference across and between jurisdictions. While the EU seemingly leads itself into ever-closer union and some degree of totalising sovereignty (particularly in fiscal and social matters), the underlying reality reveals a vertically and horizontally competitive, inter-governmental environment where hierarchies and heterarchies interact in a regulatory matrix. In the development and contraction of non-tariff barriers to trade, the single market (through European treaties and directives) allows for some degree of subcentral authority to dictate terms of trade and the mechanisms for production and exchange (for example through certification of products in particular states/regions that then can move into the wider single market through terms of mutual recognition, allowing for production system fragmentation as different spatial systems engage with different production forms that create sub-market systems in facilitation, legal arbitrage and the tailoring of production to local/regional needs and infrastructure). Similar differentiation within a generic rules-based system can be seen in tax jurisdictions, EMU-based constraints on national fiscal policy, and competition amongst levels of government. All contain contingencies and the interaction of variable rule structures with socio-political obligations set by stakeholders and voters. The EMU constraints have allowed for large deficits and debt-to-GDP ratios. Competition between levels of government and within these levels has engendered policies contained amongst municipal, regional, national and international actors, increasing the scope for cooperation, regulatory conflict and conceptions of exit within the wider policy arena. Tax jurisdictionality allows for variable tax rates and the ability to domicile. Intergovernmental competition now goes beyond national borders, as cross-border regions in the Rhine Valley (that facilitate cooperation in land-sharing, water governance and regulatory alignment) and the effects of municipal competition (urbanistic innovations such as transport systems, integrated highways and multi-region conglomerations) show. The EU commitology system is a concomitant example of this process, noting how the EU system of committees and directives attempts to tie into a totalising picture of European sovereignty and statehood. However the flexible nature of committees, including their tendency to break and fall apart, combined with the issues of fiscal centralisation and general bureaucratic turbulence lead to reform that generates power distribution and decentralisation. The Open Methods of Coordination (a directly deliberative process that allows for the introduction of local/stakeholder knowledge into the processes of commitology dialogue and policy procedures) and the increasing need to build effective exit mechanisms into prevailing EU directives and laws (such as GDPR and its relation to large data systems and the incredible vagueness of the legislation) are such examples of flexibility. Polyarchy and private law thus always sit around these centralistic mechanisms, chewing away until general fragmentation and open source stakeholder policy develop equanimity. Such can seen in the parallel example of water governance through the WFD, where co-deliverers who want greater decision-making capacity form alternate forums and increase their demands as effective law-making stakeholders. This doesn’t then just mean exit in the crude sense of Brexit or Catalonian independence, but the cellular breakup of stakeholders and their re-engineering across multiple sovereign and scalar lines. This fragmentary nature can also be seen in the general provision of European law alongside national and international private law structures. The ECJ and the general regulatory-directive system delineated through the committees as well as private means of enforcement show a degree of flexibility enforced by the situation of fragmented sovereignty that passes through the single market (a market without a state) and multiple levels of government and sub-governance. In this capacity of legal interlocutor, it creates and loosely enforces a general set of principles whose normativity and applicability are matched and pushed through national legislative systems and private enforcement mechanisms, making something akin to a transnational private law society. This also leads to forms of mixed governance structures, as the neo-bureaucracy of non-majoritarian institutions intersect with polyarchical claims to resources and decision-making ability amongst stakeholders. As Joerges notes “where an institutional innovation threatens the normative coherence of a legal system or fosters new inequalities. European impacts of this kind cannot be predicted or addressed in advance. Instead, their remedy is fully dependent on the development and maintenance of sensitive co-operation between European and national judiciaries; on the one hand, requiring a decentralised fine-tuning of the impact of European law on national legal systems by national courts; and on the other, being equally dependent upon the underlying readiness of the European legal system to respect normative concerns within the Member States even at the price of a loss in overall uniformity. Rephrasing once more; just as the incompleteness and imperfection of the European polity requires the recognition of spheres of regulatory autonomy, even those European frameworks and regulatory legal objectives which have prior and overwhelming consent, may not pre-empt the autonomous search for justice through private law at decentralised levels”. Joerges notes the Pronuptia case in Europe as an example where the intersection of national franchising laws met with European competition law, where the specificities of the case split between German contract law and EU-level competence, leading to the integration of the former into the rules-based, variable system of the latter. The variable nature of EU legal governance provided overarching, interpretable frameworks that allow for innovative mechanisms of implementation. Another example of such dissipating affects within EU legislation is the recent implementation of GDPR protocols, showing cellular elements in EU policy. It mandates through effective vagueness, mainly requiring the drawing up of data protection policy agreements and data contracts by institutions, setting the stage for mixing supranational regulation with multiple forms of private law. While Downes sees this as the end to the great internet bargain (advertising revenues funding freely-accessible platforms), his analysis ignores the potential for legal innovation, including the rise of potential data brokers or user unions for collective payment and tort action through national and supranational court systems, as well as the provision for general understanding of individual ramifications of data usage and control. Article 12.1 states that “The controller shall take appropriate measures to provide any information […] relating to processing to the data subject in a concise, transparent, intelligible and easily accessible form, using clear and plain language”, providing guidance in this area, allowing for layered privacy notices and a granular, step-by-step approach to developing data regulations within businesses and institutions. While Downes criticism of the law in relation to EU governments is correct, the innovatory potential for individual and collective data control means an increasing desire for control in all facets of life, moving the complexity of data from centralised units to shared control between consumers, businesses and governance structures. With the EU’s previous interactions with private law, precedent is already set for variability in the applicability of GDPR in relation to businesses and government, meaning different regulatory regimes and competitive arbitrage. This is by no means a celebration of GDPR, but rather a recognition of the potential for general rules-provisioning combined with variable compatibility, diagonalising legal sovereignty into the turbulence of multi-system organisation. Developments that encourage innovative governance are opened up as sovereignty through juridical means is continually split into particles. This is no celebration of the EU as some particularly innovative institution. The increasing lack of growth and increases in public and private debt suggest an increase in the demosclerosis that afflicts most Western governments. However what can be seen is the potential for regulatory and legal avenues that circuit round the centralised diktat of Western governance. The failure of fiscal centralism and the increase in national populism and municipalism suggest a radical new direction for monetary and fiscal affairs. Regions and member states, in avoiding liquidation and bankruptcy, may look toward the Euro as part of a basket of currencies through which budgets and public/private business can be directed, multiplying the uses and creation of currencies through semi-independent bank structures which effectively whittle away fiscal centralisation. The EU for all its talk of ever-increasing union and increasingly centralised competence cannot escape the dynamics of decay and decentral activity both within its institutions and outside them, moving from centrality to a de-bundled European village. Already, the EU, far from the development of new central sovereign possibilities, resembles a multi-system set of policies and governmental structures that overlap and intersect. And ironically, as it increasingly gears itself toward ever-closer union (along the way creating concessions to national, regional and private forms of governance and juridicality), it engenders means to competitive and innovative governmental environments that then bias toward decentralisation and distribution of political power. The EU, being built on contingencies, generalisable rules that allow for opt-outs and breaks, and multi-level systematicity, cannot reasonably construct a totalising polity without building-in dissolutionary tendencies. “There will always be a strong incentive among decision-makers to bargain and engage into trading positions over issues”. All of this suggests the Hobbesian picture of the total state is one built on a mythical rationality that is not found in any polity. While rigid hierarchies and rational bureaucracies may well allow for the development of economic growth and national solidarity, the sclerosis of the demo-bureaucratic nightmares we see today suggest their lack of flexibility and inability to dissipate competence when crisis and stress do appear, meaning they are increasingly unable to adapt to the growing needs and issues of organisational complexity. Further, the actual existence of sovereignty is always that of a variegated polity, affected and swayed by stakeholders, deliberative institutions, voters and subcentral governance authorities (municipalities, non-state bureaucracies, commissions, consociations, regions, international organisations, technological developments, etc.) The Hobbesian jungle of all against all, the basic conflict that defines political institutions and leads toward cycles of power centralisation and dissemination, always exists above and between Leviathan.